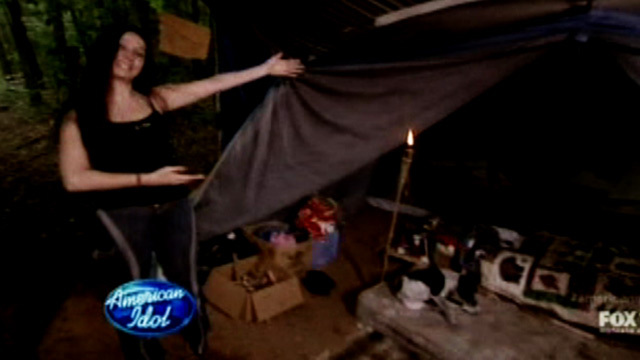 "American Idol" wannabe Amy Brumfield ... the 24-year-old singer who lives in a tent ... has a LONG criminal record ... revealing a serious battle with alcohol. According to police records obtained by TMZ, Brumfield has been arrested at least 6 times in the past 7 years ... with 3 arrests involving booze. Brumfield -- who blew the "Idol" judges away with her rendition of Superwoman by Alicia Keys -- was arrested in Tennessee on August 22, 2010 after cops say she was so drunk, she peed on herself in the lobby of a Baskin Robbins. Just 9 days before that -- on August 13 -- she was arrested in front of the Ole Smoky Candy Kitchen ... after cops say she was displayed "extreme intoxication" ... and was "trying to find someone to take her home." Brumfield was arrested twice in 2007 -- once for unlawful detainer (staying at a property after her lease had ended). The other arrest was for underage consumption of alcohol -- for which she pled guilty and was sentenced to probation. Brumfield was also arrested in 2005 for criminal trespass on private property -- the details around that incident are unclear. But this story could have a happy ending, judging by her audition on "Idol" last night, Brumfield appears motivated to start a whole new life for herself.